Why Do You Use A Facebook Autoposter? Did you know that the benefits of using a Facebook autoposter are immense? With regular use, it brings you immense returns in the long run! Facebook automation has become the need of the day. Social media management tools such as Fan Page Robot facilitate the process. You can stay ahead of the online competition effectively with the help of such content curation and marketing tools. Since Facebook has become an integral part of our lives personally and professionally, it stands as a powerful brand enhancing and customer communication tool for small businesses and online services. There should be continuous social media activities through posts and updates to engage your audience and attract them further to the service or product you offer, opined the social media experts. The trick is to use Fan Page Robot to auto post to Facebook pages! 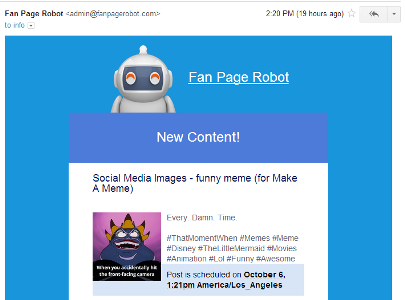 Fan Page Robot allows you to auto post to Facebook on a scheduled and regular basis. 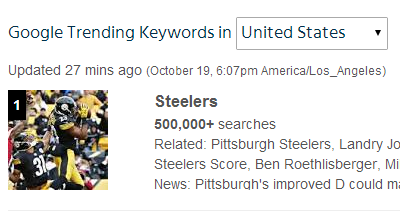 You no longer have to manually spend hours searching for relevant content to post on your business page. It will also search the content as per the keywords and automatically post it to Facebook at your preferred time of the day while you manage other equally important things without tensions! Automated social media marketing software help you save vital time. 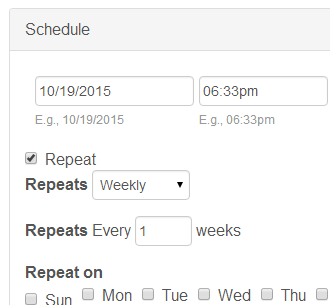 Fan Page Robot is very efficient when it comes to time management and focusing on other core business matters. Moreover, it saves you from the ordeal of remembering user ids and passwords for all your social media accounts. It will load the content from your Twitter and Instagram accounts, and automatically post it from Twitter/Instagram to Facebook, or post Facebook to Twitter automatically. This social media auto poster actually gives you the respite from spending half of your day in social media login time and posting. All you need to do is enter your Twitter/Instagram page URL, select the keywords pertaining to your niche market and our Facebook autoposter will auto post content on your behalf. Moreover, you are able to wield the power of “personal touch” customers want from your Facebook business page. Just like the feature of Facebook to Twitter auto post, you can make Wordpress auto post to Facebook pages. It’s proved that it can get a lot of likes and drive more traffic to your Wordpress website. You are able to convert more leads into sales and enhance returns on investment. 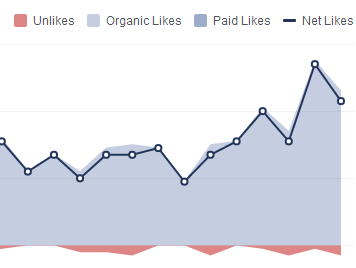 The Facebook automation strategy assures you get consistent profits over a regular period of time! Search engine optimization is an indispensable segment of internet marketing and online brand presence. If your business page or website is not SEO optimized, it becomes a complete waste. With Fan Page Robot’s all-in-one social media autoposter, your social content will reach out to more existing and potential customers with ease! With our social campaign builder, you can automatically turn any internet pages into your landing and sales pages and auto post the links to Facebook! You can easily monetize and make money from your business pages. Conversions and likes increase because of active social media presence and this means more lucrative profits for your business. All this can be done with a single click. Make money while you reach out to existing and potential customers at ZERO marketing and promotion costs! Therefore, what are you waiting for? Join us today and utilize our Facebook auto poster to get more likes and start churning lucrative rewards for your business now!